The present building was erected by Dr. Thomas George Nugent. In 1808-44 Thomas George Nugent lived here. On 2nd October 1808 Thomas George Nugent married Jane Lloyd of Cardigan. On 16th October 1809 Thomas G. Nugent, surgeon, became a burgess of Cardigan. In 1811 Thomas George Nugent and his wife Jane Nugent lived here. In 1816 Jane Nugent was probably born here. In 1821 Mary and Ellen Nugent may have been born here. In 1825 T. G. Nugent owned shares in the 129 ton Cardigan ship ‘Hope’. In 1827 Sophia Nugent may have been born here. On 27th August 1830 Thomas George Nugent, widower, was granted a license to marry Martha Child at Robeston Wathen. On 24th November 1830 Mrs. Martha Nugent was buried at St. Mary’s Church following her death at the age of 43. No. 56 is marked on John Wood’s 1834 Map of Cardigan as belonging to Thomas George Nugent. In May 1835 Elizabeth Nugent, daughter of T. G. Nugent, died aged 13. In February 1836 Thomas Nugent, son of Thomas George Nugent, died aged 23. In 1841 the occupants were: Thomas George Nugent, 55, surgeon; Jane Nugent, 25, his daughter; Mary Nugent, 20, daughter; Ellen Nugent, 20, daughter; Sophia Nugent, 14, daughter; George Nugent, 30; Margaret Nugent, 25; and 5 servants. On 29th June 1843 George Lloyd Nugent of Pendre, widower, son of Thomas George Nugent, married Martha Pearce of Pendre. In 1844 T. G. Nugent traded as a surgeon and a sub-distributor of stamps. In ca. 1848 Lewis Evans, solicitor, lived here. In 1850 John Bartlett Bevan, surgeon, kept a stamp office here. In 1851 John Bartlett Bevan, 66, surgeon, probably lived here, together with Dinah Gwyther Bevan, 24, his daughter; and Rachel Jones, 15, house servant. On 17th July 1852 Alexander Phillips Bevan, assistant surgeon, son of Alexander Phillips Bevan, married Elizabeth Thomas, milliner of Pendre, daughter of shipwright William Thomas. On 11th May 1854 Dinah Gwyther Bevan, daughter of John Bartlett Bevan, married surgeon David Mathias of Pendre. David Mathias lived here from 1860-71. On 4th March 1860 Elizabeth Bevan Mathias, daughter of David & Dinah Gwyther Mathias, was born here. In 1861 the following persons lived here: John Bartlett Bevan, 77, apothecary; David Mathias, 39, General Practitioner, his son-in-law; Dinah Gwyther Mathias, 35, daughter; Dinah J. Mathias, 3, grand-daughter; Elizabeth Bevan Mathias, 1, grand-daughter; and 2 servants – Mary Morris, 16; and David Davies, 17. On 13th September 1861 John Bartlett Bevan was buried at St. Mary’s Church, having died aged 77. By February 1876 Philip Arthur Kell, Consulting Engineer, occupied No. 56. On 31st May 1876 Philip Arthur Kell, son of Civil Engineer James Graham Kell and Cordelia Kell of No. 56, was baptised at St. Mary’s Church. In 1877 J. G. Kell & Mrs. Kell lived here. In 1881 the following persons lived here: William Davies, 41, General Practitioner; Johnny Davies, 15, nephew, student; Isabella, 35, housekeeper; Anne Davies, 17, housemaid; and David Richard, 12, groom. In 1881-93 William Davies, surgeon, lived here. In 1891 William Davies, 52, G. P., lived here with 3 servants – Isabella Allen, 48, widow; James Morris James, 16; and Anne Eliza Jones, 14. In 1891 William Davies was a Borough Magistrate. On 26th June 1891 No. 56 was advertised for sale. On 11th July 1893 William Davies, J. P., surgeon, died at Poppit, St. Dogmaels. Pendre House was advertised for sale again in August 1893, July 1894 and 19th April 1895. It was referred to as “vacant” in May 1894 and said to be a five storey building with seven bedrooms plus attic. It was last occupied by Dr. William Davies. n 1895 Rev. Isaac Morgan, Curate of Llangoedmor, lived here. William Henry Davies, land-surveyor & estate agent, traded here, as did George Thomas, boot-maker. In 1895 No. 56 was referred to as ‘No. 55’ and ‘No. 56’ – the latter was used by Daniel Davies, commercial traveller. 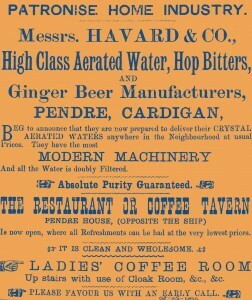 In April 1895 Pendre House was advertised for sale. In May 1896 the “Cardigan Restaurant, Baths & Mineral Water Works” opened here. Water was bottled in a workshop in the back yard and there were Turkish Baths upstairs. Messrs. Havard & Co. ran the enterprise. 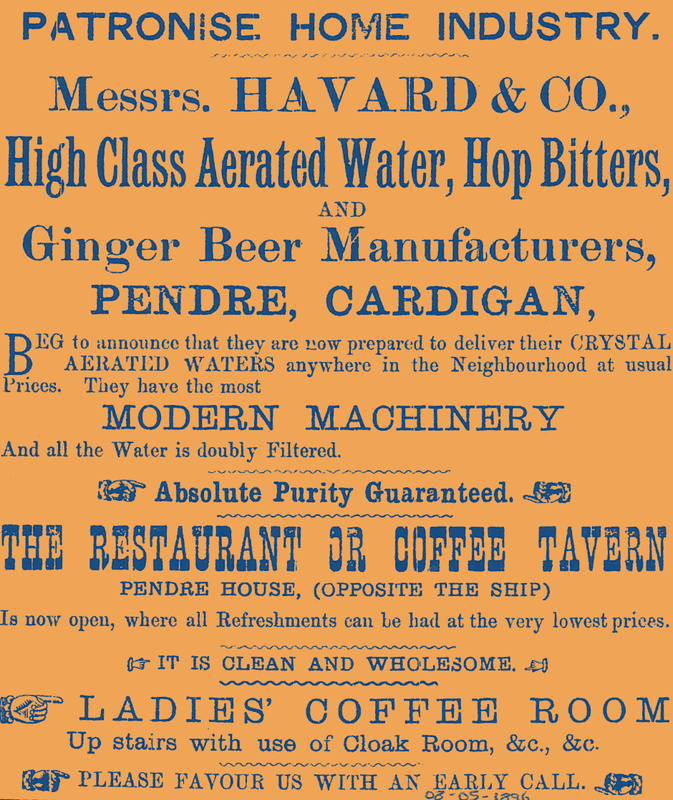 On 12th January 1900 Messrs. Havard & Co. produced plans for a new premises on the Strand. In 1891-1913 David Evans, jeweller & watch-maker, lived & traded at Pendre, perhaps initially in No 57. On 25th October 1894 a son was born to Mr. & Mrs. David Evans, jeweller. On 2nd December 1896 Jack Evans was born to Mr. & Mrs. David Evans, watchmaker, of No. 57 Pendre. On March 1897 jeweller David Evans offered the forecourt of Pendre House to the Borough Council for widening the thoroughfare, provided that they agreed to cover the cost of the new pavement. On 4th August 1899 a son, Thomas Trevor Evans, was born to Mrs. & Mr. David Evans. Mrs. Bowen was recorded here in 1901. In 1901 the following persons lived here: David Evans, 36, jeweller, watch-maker & shopkeeper; Abigail Evans, 32, his wife; Willie Evans, 9, their son (b.02/12/1891); Jack Evans, 6, son; Annie Evans, 4, daughter; Thomas Trevor Evans, 1, son; and David Evans, 69, father, retired master mariner. All were bilingual and born in Cardigan. On 28th February 1902 a son was born here to Mrs. & Mr. David Evans. On 29th October 1902 Captain David Evans Snr. died aged 70. In 1911 the following persons lived here: David Evans, 46, watch-maker; A. A. Evans, 42, his wife; Willie Evans, 19, their son; Jack Evans, 16, son; Annie Evans, 14, daughter; Tom Evans, 11, son; and Ivor Evans, 9, son. David Evans, jeweller, died here on 20th August 1913, aged 49. He left a widow and five children. The business passed to his brother. In October 1914 Sergeant Willie Evans of No. 56 was killed by a stray bullet whilst training at Scoveston. In 1914-2013 No. 56 remained a jeweller’s & watch-maker’s shop, trading as “David Evans & Sons”. Reference was made in January 1916 to Company Quarter Master Sergeant W. D. Evans, son of Mrs. D. Evans, jeweller of Pendre House. In January 1918 Thomas Trevor Evans, 18, son of the late David Evans, appealed against his “call up”. Ivor Rees Evans lived here in 1938, together with David William Evans, Thomas Trefor Evans and Elizabeth Anne Evans. On 14th November 1938 Miss Elizabeth Anne Evans, daughter of Mrs. Evans and the late David Evans, married Gwilym Ernest Owen of Aberystwyth. On 1st September 1945 David William Evans of No. 56 married Mary Lavinia Roberts of Northgate Terrace. In October 1951 Mrs. Abigail Ann Evans of No. 56 died aged 82. Thomas Trevor Evans lived here in 1952. At the end of May 1954 Thomas Trevor Evans of No. 56, son of the late David Evans, died aged 54. In 1955 John Humphrey Evans, Gwilym Ernest Owen and Elizabeth Ann Owen lived here. On 5th May 1971 John Humphrey Evans, last surviving son of David Evans of No. 56, died. 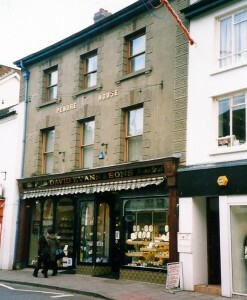 In 1982 permission was granted to David Evans & Sons for alterations to the frontage and the creation of a second shop at the north end of the building. The work was conducted in 1983. The china shop was extended that year. On 1st September 1999 a new extension to the shop was opened. In January 2005 a refurbishment of the façade took place. Old photographs show 3-storey, 3-window house in unpainted stucco with pitched slate roof, raised surrounds to windows with keystones and sashes to first and second floors. Ground floor has continuous projecting fascia with shopsign and cornice with rusticated section to left with cambered headed door, and shop to right.